The proposed 8W Center project is expected to open the Summer of 2016. The 80,000-square-foot building will be at 805 S Walton Blvd. across from the Wal-Mart’s home office now has a Jimmy John’s restaurant on it. BENTONVILLE -- A six-story office and retail building will soon be the defining structure at the southeast corner of South Walton Boulevard and Southwest Eighth Street. Planning commissioners approved development plans, 6-0, for what will be known as 8W Center at its meeting Tuesday. Commissioner Richard Binns was absent. The development will be across the street from the Wal-Mart's home office. Plans show the project will be 180,000 square feet and will have office and general commercial space as well as a parking deck. The building's exterior will be made of glass, brick, architectural stone and a zinc composite metal panel. The top five floors will be office space, and the ground floor will have retail shops and restaurants, all of which will total 80,000 square feet, according to Morrison-Shipley's website. Morrison-Shipley is the civil engineer and land surveyor for the project. Bentonville-based Nielsen Architecture is designing the center. The parking deck will include 180 parking spaces, six of which will be handicap accessible, according to the city staff report. The plans also show a brick patio with benches on the proposed 20-foot-wide utility easement along South Walton Boulevard. A 10-foot-wide concrete trail will also be built on the development's west side. It will connect to the trail to be built on Southwest Eighth Street's south side during the widening project, Troy Galloway, community and economic development director, said Tuesday. "It certainly can be catalytic," Galloway said of the 8W Center project. "It's going to give some form to that intersection of Walton (Boulevard) and Eighth Street...and I think it's going demonstrate the community's confidence of what the city's trying to accomplish along North Walton Boulevard." The current 5,022-square-foot building on the site is occupied by a Jimmy John's sandwich shop in the half closest to North Walton Boulevard. Jack Link's Beef Jerky formerly operated out of the other half, which is office space. There's a sign on the door saying it's moved to 1006 Beau Terre Drive. The building is owned by Troy Link Enterprises, according to county property records. 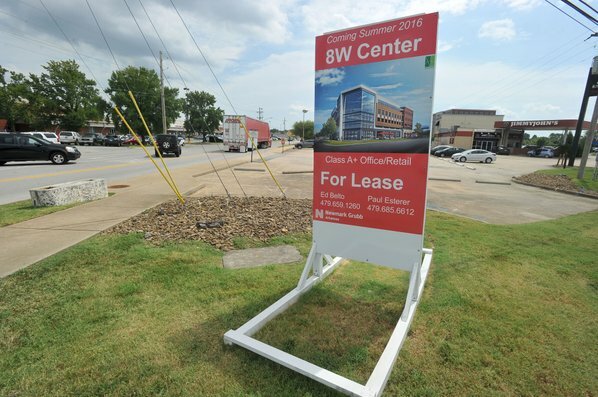 The project's owner is 8W Center LLC, a real estate investment company of Troy Link, said Paul Esterer, principal and executive managing director of Newmark Grubb Arkansas. Newmark Grubb is the developer and leasing agent for the project. Nearly 20 percent of the space is already leased, Esterer said. Another 30 percent is in negotiation with other tenants. Jimmy John's will be a tenant in the ground floor, he said. Construction is expected to start in October with demolition and site work starting as early as September, Esterer said. Construction is expected to take a year and be complete by fall 2016. Dave Grundfest Company of Little Rock is the general contractor. Commissioners also approved plans for an Arvest Bank ATM drive through south of the center.